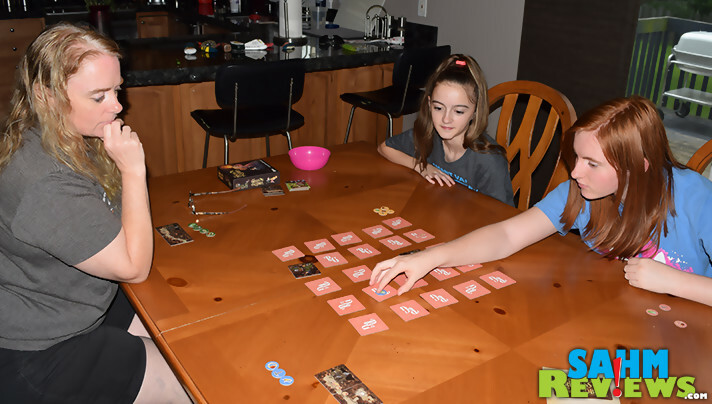 Most recently we were able to try out another small-box game from Bellwether Games called “The Princess and the Goblin“. This wasn’t your typical memory game though – it was something much more challenging since you not only had to remember which tile was which, you needed to place them in the right order. That will make more sense in a minute. The Princess and the Goblin is about a young Princess Irene who discovers her magic golden thread led straight into the goblin kingdom under the mountain. She has ventured into the dark, coming across her friend who has been trapped while searching for clues to the goblin’s evil plans. Irene and her friend must now escape the maze of caverns. You play your own version of Irene and are also trying to escape while gathering clues along the way. The 26 mountain tiles are shuffled and set in the middle of the play area, with one being dealt to each of the stack’s four sides. 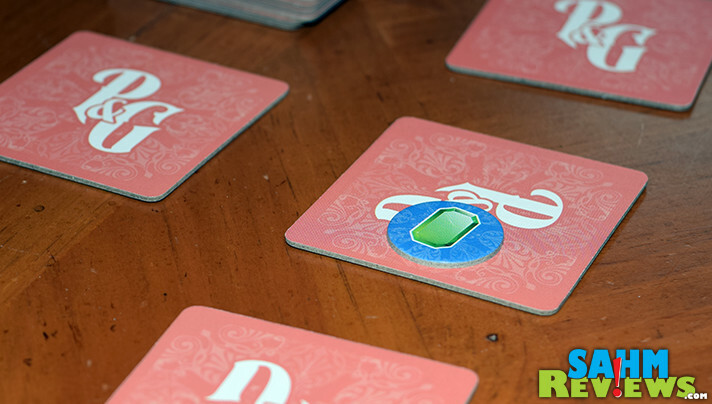 On each player’s turn they will draw one from the stack and place it anywhere in the kingdom, as long as at least one side is touching another tile. They then get to peek at each tile it is adjacent to. Everyone has four “breadcrumbs” at their disposal they may place on the turned-down tile to help remind them what they saw. These are played optionally and sparingly, since whoever collects them later receives a point for each one. Play moves in clockwise order, with each person adding a tile to the “pool”. At any point during The Princess and the Goblin, a player may announce they are trying to escape from the mountain. That player no longer adds tiles to the center on this, or any future turn. Instead, they are given a Goblin Palace Tile to place in front of them. 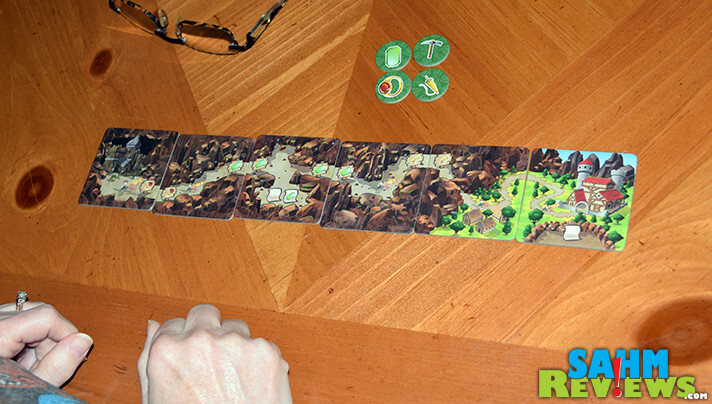 On their turn they instead flip over and grab one of the tiles from the caves (including the mountain) and try to add it to the Goblin Palace Tile. Tiles may only be played in one direction, and their paths must line up to be valid. Match the tiles and the same player may continue drawing until they either escape or are unable to match their most recent selection. Draw and place any tile with green grass and you may take any available Home Tile and place it at the end of your path. This means you escaped successfully! No match simply means your turn is over and that last tile is put back in the center. Iif you receive a tile with a goblin on it, you are caught! Return all your collected tiles back to the caves (face-up this time). On your next turn you must start the escape again, possible having your tiles already taken by other players! 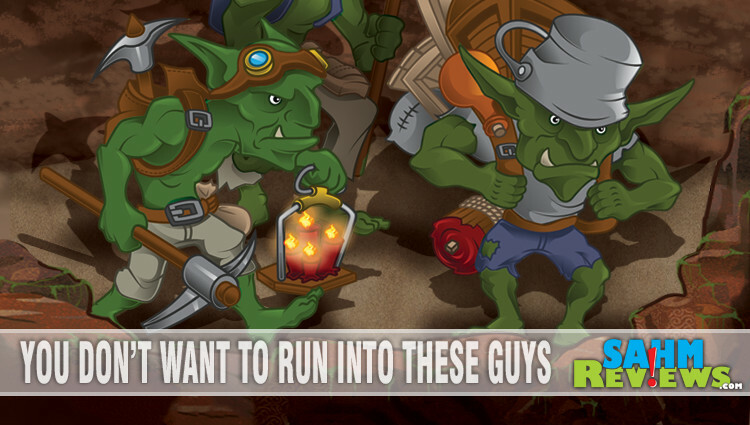 In addition, once any player is working on their escape, another player may call out “Goblins” and reveal a goblin tile, forcing the escaping person to lose their turn. Just escaping doesn’t mean you’ve won the round. The game continues until all players have escaped or when all remaining Home Tiles have been flipped to show goblins. Escaping players receive one point for every clue in your Escape Path, plus a point for every breadcrumb you captured. Obviously, the princess with the most points is the winner! 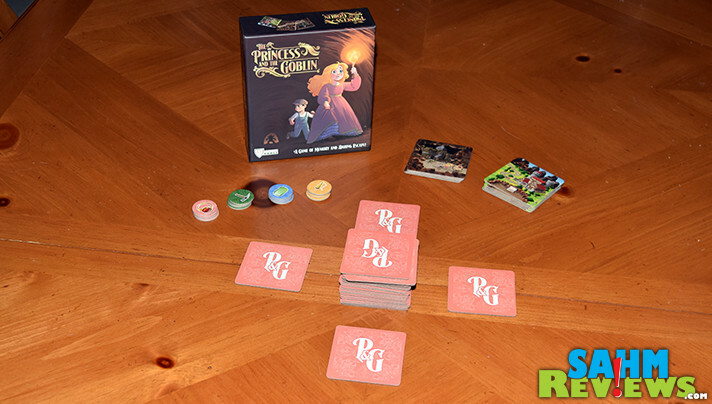 The Princess and the Goblin supports up to four players and you can expect a round to last around 15 minutes. If you family enjoys memory games, you can pick up a copy on Amazon for under the $25 MSRP. But be warned, your kids will certainly have an advantage – and that’s ok. It’s good to let them win once in a while. 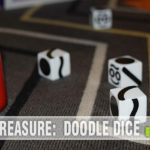 Check out three other games from Bellwether Games we highlighted this past Spring, and hop over to their website to see what other games they have in their library. We know they have at least one other new title in the works, so be sure to follow their Facebook and Twitter feeds to get the scoop! How well do you do at memory games? 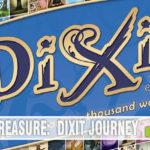 I’m learning about this board game for the first time, and I am thrilled! My son and his friends will definitely have a blast with this! When i was younger i used to play memory games and i loved it. this Goblin board game is something that i want to try. I am so excited to learn this game! 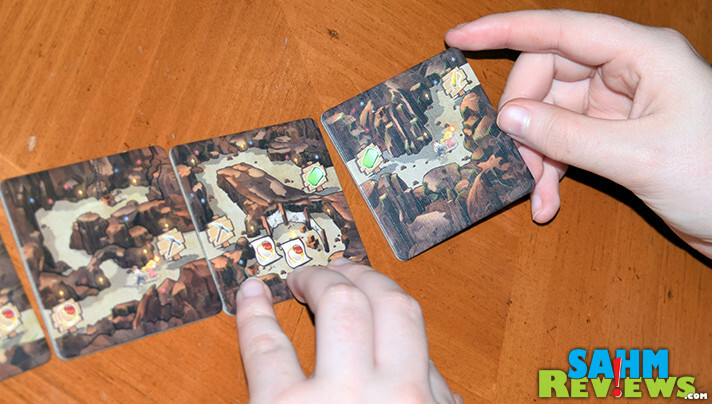 The Princess and the Goblin by Bellwether Games, sounds like a great game for my niece’s kids and my family. 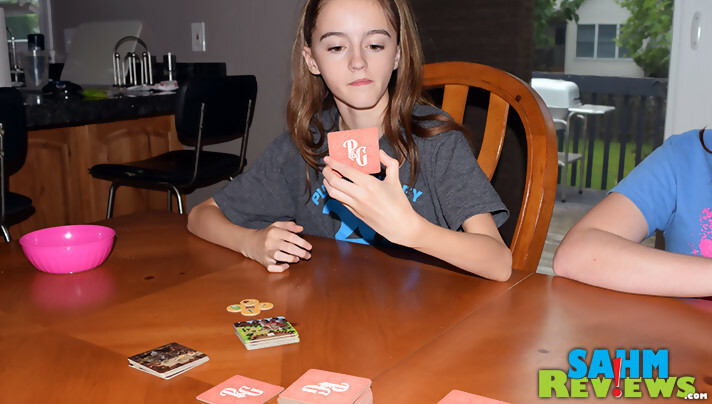 We all love the memory games and we are all very competitive too. 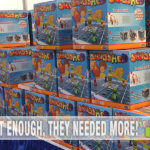 Thanks for sharing this awesome and interesting memory game. I haven’t played a memory game in a long time. My grandmother passed from alzheimer’sin 2014 and I am always looking for ways to keep my mind sharp. I know a bit of it is genetics because she did puzzles, read and crosswords till as long as she could. Oh I’ve been to your blog before! I love the info you provide on board games. I think a lot of us start forgetting how fun and also how healthy they are. You know… I think I might go buy one for my husband and I.